Artists Recording Collective (ARC) is pleased to welcome the progressive ensemble, Alchemy Sound Project to our roster of stellar record producers. Alchemy Sound Project is a collective of composer/performers whose music is a synthesis of jazz and modern chamber music. While the group’s configuration and roots serve as a continuation of the jazz tradition, the members also compose orchestral works, film scores, chamber music and solo pieces for various ensembles and projects across the Americas, Africa, Europe and Asia. Music education, support for the arts and expansion of cultural self-awareness and empowerment are important themes for this group. Tenor and soprano saxophonist Erica Lindsay is an Artist-in-Residence at Bard College, NY where she teaches jazz music theory, arranging and composition. Lindsay performs with numerous ensembles at Bard, often featuring her own compositions and arrangements. The Da Capo Chamber Players performed Erica’s chamber work Further Explorations in 2015. Erica has performed and recorded with such artists as Bob Braye, Rufus Reid, Lewis Nash, Baikida Carroll, Oliver Lake, Pheeroan akLaff, Art Blakey Jazz Messengers (with Jimmy Cobb), Howard Johnson, Frank Zappa, Melba Liston, McCoy Tyner and Clifford Jordon among many others. Lindsay’s orchestral piece Inner Dialogue was read by the American Composers Orchestra in 2011. Her piece for drum set and orchestra, Mantra, was performed by the Detroit Symphony Orchestra in 2014. In addition to symphonic, chamber works and jazz compositions, pianist Sumi Tonooka has composed over twenty film scores, including the Academy Award-nominated Family Gathering by Lise Yasui and Daring To Resist by Martha Lubell. Her most recent film score is a 2014 documentary on jazz great Mary Lou Williams, Lady Who Swings the Band by Carol Bash. Sumi recently received the Music Alive: New Partnerships residency with The South Dakota Symphony Orchestra through New Music USA to take place in November 2015. The residency will culminate with a premiere of her symphonic work Full Circle and a new work for woodwind quintet. Multi-instrumentalist Salim Washington is a Professor of Music at the University of KwaZulu-Natal in South Africa where he teaches jazz music theory, arranging and composition. Washington held a tenured professorship at Brooklyn College, NY before making the move to Durban. He felt drawn by South Africa’s complex political evolution and is highly active in promoting broader African social and political issues. The presence of strong jazz musicians in South Africa is the icing on the cake. Washington has worked with jazz visionaries such as Fred Ho, with whom Salim played in contexts such as the Afro-Asian Music Ensemble. In 2012 they started the Scientific Soul Sessions, described by Salim as “a collective for revolutionaries to build a soulful and scientific community.” Washington is renowned for his use of art to inform politics and vice versa. Double bassist David Arend is a freelance artist who moves easily across classical, jazz, electronic, avant garde and singer/songwriter contexts. A longtime member of the Oakland Symphony, Arend has worked with the San Francisco Symphony, Carlos Santana, Bobby McFerrin, Ornette Coleman and George Crumb. Arend’s compositions filter his broad influences into forms ranging from jazz, orchestral, chamber and solo works to electro-acoustic projects and collaboration with DJs. David premiered his Sequoia Sempervirens for double bass and orchestra with the San Francisco Academy Orchestra under Andrei Gorbatenko in 2010. David premiered his double concerto Voyager: Three Sheets to the Wind with Philharmonia Northwest under Julia Tai in 2013. Both pieces were recorded with the Moravian Philharmonic Orchestra (Czech Republic) for release by Navona Records/Naxos. Trumpeter Samantha Boshnack has helped to anchor the Seattle, WA modern jazz scene under a variety of guises. 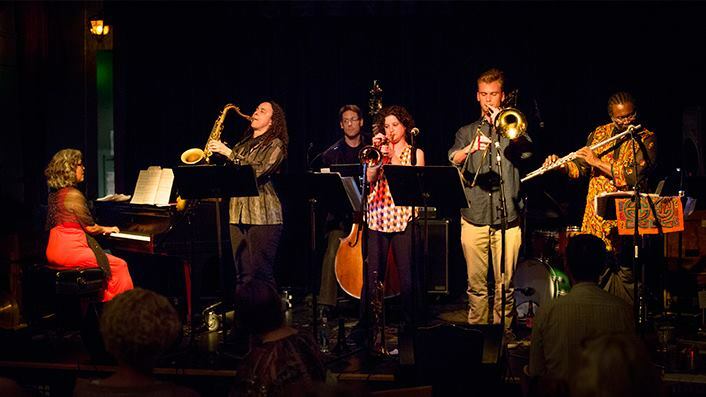 As a bandleader, Boshnack performs her compositions with B’Shnorkestra and the Samantha Boshnack Quintet, and as co-leader with Reptet. As a collaborator, Boshnack has worked on a wide scope of projects with artists such as Butch Morris, Eyvind Kang, Oliver Lake, Los Campesinos, Bobby Previte, David Byrne, Terry Riley, Stuart Dempster, Skerik and Wayne Horvitz. A featured artist in the Frye Art Museum’s Moment Magnitude exhibit showcasing exceptional artistic practice in Seattle and one of 16 artists selected for an Artist Trust Fellowship, Boshnack was named Emerging Artist of the Year by Earshot Jazz in 2012.